Latest win launches TravPro into the all-inclusive hotel space. Platform will launch before the first-quarter 2018. No one else is offering a solution like TravPRO. This new enablement platform will greatly enhance our agent’s ability to sell a lot more Barceló. We believe it’s going to be a game changer. 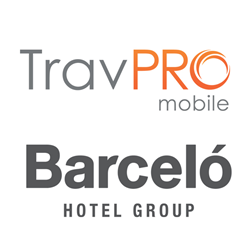 TravPRO Mobile a global leader in the B2B2C sales training and enablement space, announced today it has begun working with the Barceló Hotel Group to launch a new agent enablement platform for North America. The Sales Companion™ solution will provide agents the ability to access critical selling information anytime, anywhere; across web, tablet and smartphone’s for both IOS and Android. While many are familiar with training, mobile sales enablement is still relatively new concept within the travel space. Enablement picks up where training leaves off, providing ongoing anytime, anywhere access to critical product information, empowering many more agents with the knowledge they need to close additional business. Work is already underway on the project. An accelerated timeline has been developed to launch the Sales Companion™ this year, well ahead of the critical first quarter booking season. About TravPro Mobile: TravPro Mobile is redefining global B2B2C training and sales enablement. Beyond training, the award-winning Sales Companion™ enables a greater number of sales reps to easily train, retain, promote and convert more bookings vs. just a few super stars. To find out more visit http://www.travpromobile.com.